Global Oil Water Separator Market is expected to reach USD 9.63 Billion by 2024 from USD 7.42 Billion in 2016 at a CAGR of 3.8%. 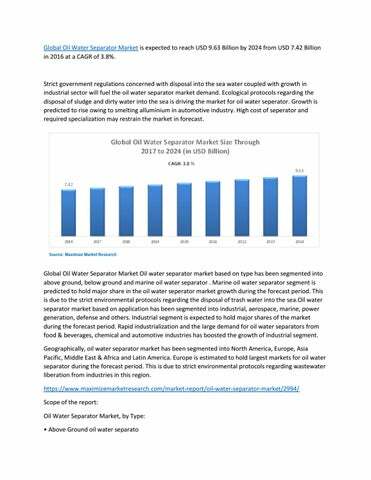 Strict government regulations concerned with disposal into the sea water coupled with growth in industrial sector will fuel the oil water separator market demand. Ecological protocols regarding the disposal of sludge and dirty water into the sea is driving the market for oil water seperator. Growth is predicted to rise owing to smelting alluminium in automotive industry. High cost of seperator and required specialization may restrain the market in forecast.